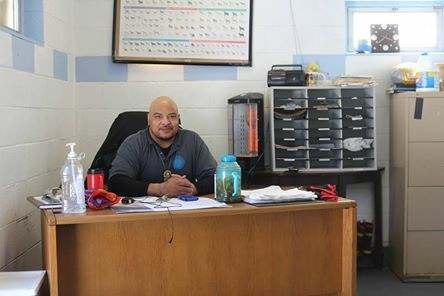 When I read about two dogs who were at the East Orange NJ shelter, I cringed at what people can do to animals but then became immersed in the story about Alex, the animal control officer for the city and caretaker of the animals at the shelter. Just the location of the shelter, literally behind the city dump – they share the parking lot – was attention-getting. Then I read that Alex furnished his office by finding and repairing furniture he found at the dump and painted with paint he found there too. Wow! I thought there is someone who knows how to make the most out of any situation. At the time I must share I was a little off my Pollyanna game: in pain from an injury, cold from a long, snow-filled winter, complaining about various and sundry, this story knocked me over with kindness, goodness, compassion and inspired me to write about this young man, Alex, someone I don’t know – but surely admire. So who is Alex? A hard worker for sure. When Susie’s Senior Dog humans visited they found the shelter cleaner than most shelters and with no other staff besides Alex. He also rescued the two dogs featured on Susie’s posting, from a life in a foreclosed house filled with dirt and filth. Apparently the shelter’s reputation has not been the best but the prior staff is gone and Alex is turning things around. The city provides little in the way of funding or other help which is very sad but hopefully when they see the outpouring of love for the work Alex is doing, they will find a few dollars to help these beautiful homeless animals. Alex also must have that rare ability to see things as they could be, not as they are. Check out the photo of the office with repurposed furniture and files from the dump! He must also have a good heart to care for the cats and dogs with so little in the way of resources*. And he must also enjoy a challenge – rebuilding a shelter’s reputation is no easy job. The other thing I noticed is that, on a regular basis, he is the only human at the shelter so he must really enjoy his animal companions. Alex has the dedication and other qualities I admire, that inspire me, that make me want to be a better person. Thank you Alex. *This story is to inspire and motivate others to step up and help when and where they can. It is not a request for donations or contributions. But do consider adopting an older dog, a rescue if possible, and perhaps volunteer or provide resources for a shelter that is home to so many of our animal friends.